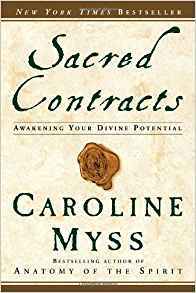 Excerpted from Sacred Contracts by Caroline Myss. Copyright © 2002 by Caroline Myss. Excerpted by permission of Random House, Inc. All rights reserved. No part of this excerpt may be reproduced or reprinted without permission in writing from the publisher. HTML and web pages copyright © by SpiritSite.com. "A contract isn't about saying what you meant. It is about meaning what you say." When I was a young girl, my father always told me, "I don't care what you do when you grow up, so long as you're a nurse or a teacher." I can still remember my fury when he would say that, because I was interested only in writing. The very idea of teaching school was out of the question. Yet today, in spite of all my efforts to avoid life in the classroom, I am a teacher -- of workshops, of theology, of motivation -- and what's more, I love it. I feel distantly connected to the nursing part of my dad's directive too, through the healing effects my work has had on many people. Still, my Contract does contain the archetypes of the Teacher and Healer, which have manifested through the events of my life, even though I have never formally studied healing or teaching. My higher education has been in journalism and theology, but my work in medical intuition simply "happened." I did my first intuitive reading almost by accident, and then another, and another. Word spread through the neighborhood, and soon I was doing ten to fifteen a week. My growing reputation led to invitations to lecture on my work, which in turn led to invitations to teach workshops. Once I understood that principle, my education seemed to move in another direction. Whereas my previous readings had focused on assessing an individual's physical and emotional chronology, I suddenly began to perceive images that had no apparent connection to the person. In reading a woman who wanted to understand her neck pain, for instance, I got the image of a pirate in her energy field. She was a housewife from the Midwest, so this information meant absolutely nothing to her. Yet while subsequently undergoing relaxation and visualization exercises with a hypnotherapist, she also sensed the pirate energy in her field. She "saw" him slashing her throat with his sword. Curiously, she also felt more positive associations, including wild lawlessness and liberated sexuality. These conflicting impressions of the pirate energy indicated to her that she was being choked or controlled by her life circumstances while yearning for a freedom that she could not consciously voice. Finally, while reading an Australian salesman named Jimmy who had been seriously depressed for several years, I saw a strong actor in his energy field. But Jimmy had never done any acting even though he did want to, because, he said, he was still "in the closet" and was afraid that if he acted, it would "come out" that he was gay. He was, in fact, already acting -- as if he were straight -- but the blocking of his talent and identity had made him implode emotionally. A few years later I was thankful to hear from Jimmy that he had pulled out of his depression and now acts in summer stock. He takes his stage work seriously, and he is no longer hiding his sexuality. When these odd images first began to emerge, they seemed so disassociated from the people I was reading, so off, that I felt that I had somehow lost my intuitive accuracy. Yet these readings ultimately proved helpful for every person. Then one day in 1991 everything fell into place for me. I was listening to a conversation between two women in one of my workshops. Within five minutes of meeting, they had exchanged the ordinary details of their lives, such as where they lived and what kind of work they did. After the basic physical details, they then spoke about what life experiences had brought them to a spiritual workshop. Suddenly they found a life pattern they shared, an energy link that was immediately noticeable in their heightened response to each other. Their children were grown, their marriages were happily established, and they had arrived at a natural transition point in their lives -- they were tired of being everyone else's "servant." Now they wanted to serve themselves. Retired and liberated, they wanted to pursue their own interests and to develop their own spirits. As I listened to these kind souls describe the pattern of their lives, I was seeing through their conversation to its symbolic level. As good mothers and marriage partners, they had acted in behalf of others for most of their lives, but having accomplished this early mission, they were now striking out on their own, as the Servant of myth and legend must. When the biblical Joseph was sold into slavery by his brothers, for instance, he bided his time and did the work requested of him through many years of service. But then he used his singular gifts as a dream interpreter to earn his freedom and become a great leader in the land -- going from Servant to Master. The mythic lightbulb that got turned on that afternoon has stayed on ever since. From that point on, every reading I did opened with an evaluation of a person's spiritual chronology, the archetypal patterns that express themselves through his personality and life experiences. And just as trios of people with the same physical illnesses had contacted me for intuitive readings, people with the same archetypal patterns began contacting me in a relatively short period of time, though spread over months rather than days. Some of my first readings, for example, were for several people who had the Wounded Child archetype, a pattern of emotional scars from childhood. Then I met a few who had in common a dominant Victim archetype. Just as before, each of these people reflected slightly different aspects of these archetypes as a result of their individual personalities and life experiences. Archetypal patterns awaken in us our own divine potential. They can liberate us from the limitations of our thoughts and feelings. They can help us shed light on the dark or little-known corners of our souls and amplify our own brilliance and strengths. Archetypes are a source of emotional, physical, and spiritual power and can help us free ourselves from fear, although sometimes, as we first get to know them, a few of them may initially unleash fears within us. Our spiritual challenge with any archetype -- or fear -- is to face it and recognize the opportunity it presents to learn its inherent lesson and develop an aspect of personal power. With an archetype that we perceive as difficult or even malevolent, our task is to acknowledge it, overcome whatever weakness it indicates, and work to make its divine potential our own. We tend to perceive ourselves and our universe as either good or bad, internal or external, me or you, right or wrong, symbolic or literal, joyful or sad. Our strengths and fears divide our spirit into polarities -- into a duality, in Buddhist terms -- which is why faith and doubt wage eternal battles in our psyches. By identifying and working with our archetypes, however, we can learn to consolidate the faces of our spirit and bring its power into our daily life to direct our thoughts and actions. These energy guides help us act mindfully and honorably; they help us manage our power and live up to our divine potential. "As I began to work purposefully with the archetypes in my readings and to teach them in my workshops, I gained further insights about how they function within our psyche."